My journalist colleagues and I were worried when Cyril Ramaphosa became our ultimate boss, almost 20 years ago. The former South African trade union icon and ANC transition architect had resigned from the ANC and – in addition to other sudden business leadership positions – had become chairman of Johnnic Holdings, which owned South Africa’s largest newspaper, the Sunday Times. But even as my senior reporter colleagues were starting to discuss how to produce critical coverage of a national figure from a notoriously media-paranoid party who now owned our company, word came down from Ramaphosa that we needn’t worry at all. His unsolicited message – anticipating our concerns – was that the Sunday Times and all other media that his company owned would have total editorial independence, and that he fully expected critical, and hopefully fair, reporting about himself. Today – with the Rand-billionaire now on the brink of becoming South Africa’s president – I find myself comforted by the experience that this man was true to his word with our free speech rights: while not always forthcoming, I cannot recall any incident in the years afterward in which the chairman interfered with our reporting or sought third party reprisal for unfavorable coverage. Although I was a news reporter rather than a political correspondent, I found that – ironically – South Africa’s scandal-prone, outgoing president, Jacob Zuma, was actually more accessible to media in years past than Ramaphosa, who came across as a deeply private man. Zuma took my calls. In 2008, on his return from the World Economic Forum in Davos, Zuma was happy to take my call on his private cell phone – a number that he knew media should not have – and he was game to do an interview with me right until the point that his plane was taking off. He wanted to talk about water security. To his credit, he had attended every water seminar on the Davos schedule. We knew Zuma as the every-man crowd-pleaser: the man in the yellow t-shirt who sang and danced with the microphone on stage, after serious ANC leaders in suits had finished their speeches. There were very few hints, during this intimate 2004 week-long trip to China, of the power-clinging patriarch who would go on to tear down so many of the institutions of democracy and accountability that Nelson Mandela had helped to establish, to enrich himself and his friends. Meanwhile, he was suing our newspaper cartoonist, Zapiro, for defamation, and seeking to restrict our right to crucial information at almost every turn. With hindsight, one hint of his ethical downfall to come was that, in our interviews, we never heard Zuma speak about his personal ideals. These – or the lack of these – he always hid from us behind a tedious stream of summaries of present-day NEC action statements. He would never respond to my questions about his own executive decisions, referring me always to a committee policy. He sidestepped accountability by never admitting to being a leader. Zuma spoke constantly about himself and others as being “deployed” or “mobilized” by the party, and about major issues as if the ANC were still a banned liberation party, rather than the governing power. He revived the use of quaint but ultimately jarring socialist-world words like “cadre” and “comrade” that made it difficult for the ANC to be taken seriously. He presented himself as a servant to be moved around at the merest whim of others, and, tragically, that is precisely what happened – except that those others had financial interests rather than citizens’ interests at heart. So now, for South Africans at home and in the diaspora, the most pressing question is this: are there signs that “Cyril” will respect South Africa’s Constitution and its potential, or signs of the opposite? And even if there are no negative hints: will the toxic influences than enthralled Zuma do the same pernicious work on his successor? Once again: attitude to media may be the clue. Just as cruelty to animals in childhood is the first and best identifier of a future serial killer, it could be argued that the avoidance and demonizing of media is the first and best indicator of a future authoritarian president. And the good news is that Ramaphosa’s media attitude record has been generally good, and media analysts believe this suggests a genuine respect for other pillars of democracy also. 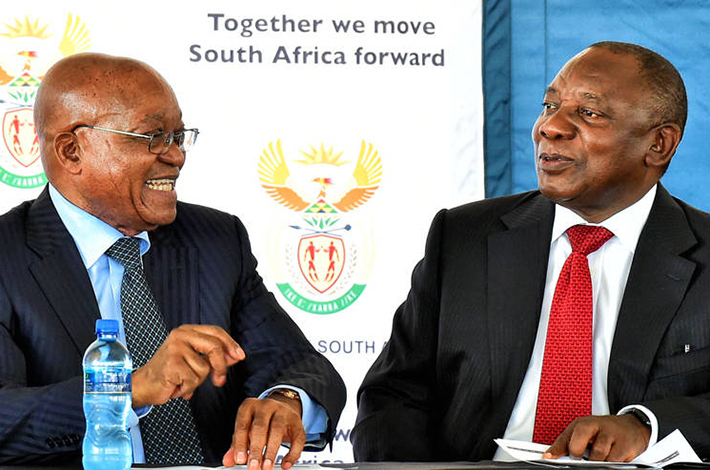 Dr. Musawenkosi Ndlovu, associate professor at the center for media studies at the University of Cape Town, warned that this might not mean much, as Ramaphosa has benefitted from positive and gentle press to date, and pointed out that Zuma faction officials remain in high positions. Meanwhile, Ramaphosa will certainly champion several costly social justice policies that might make investors and business nervous, such as the National Minimum Wage roll-out, free tertiary education, and aggressive land reform. But, in interviews with reporters this month, Ramaphosa has gone out of his way to link the fight against corruption with Nelson Mandela’s legacy. In doing so, he has set a solid bar for government behavior that goes beyond the threat of prosecution – because any breech would literally be spitting on Madiba’s memory. This is significant. But the biggest applause lines came from his frequent references to Mandela’s solutions for everything from poverty to civil rights and education – something South Africans haven’t heard for years. And when reporters asked Ramaphosa questions, he used words like “I,” and spoke easily of issues he’s personally passionate about – (like agriculture reform and income inequality) – and seems willing to take responsibility for the decisions he will make, good or bad. This willingness to lead in the public sunlight, using Mandela’s compass, signals a stunning contrast with Zuma, and offers the Rainbow Nation its first political sign of afternoon rain for many years.